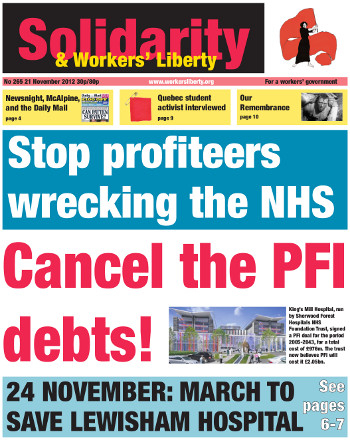 Lewisham Hospital: occupy to stop A&E closure! Greece: stop the privatisation drive! Abu Qatada should not be sent to Jordan! Campaigners for women’s rights staged demonstrations in Dublin and all over the world in protest at the death of Savita Halappanavar. Savita, living and working in Ireland, had asked for an abortion 17 weeks into her pregnancy. Her request, based on the knowledge that she had miscarried, was refused by doctors because they said they could hear a foetal heartbeat. Savita fell ill as the pregnancy continued and later died of septicaemia. Abortion is strictly illegal in Ireland. Nearly a month after the announcement that Ford was axing 1,500 jobs (closing its Southampton Transit Van plant, and cutting jobs at the Dagenham stamping plant which supplies it), there are still no details of a high-profile, public campaign against the closure from Ford unions. Shop stewards, conveners and union officials have been conducting negotiations with management. Unions are in a difficult position, particularly as Ford is attempting to bribe workers by offering handsome severance packages; but they must go on the offensive to stand any chance of saving jobs. Engineering and maintenance workers employed by Tube Lines on London Underground will strike on Friday 23 November, in an ongoing battle to win pensions and travel pass equality with the rest of Transport for London staff. Tube Lines is a wholly-owned subsidiary of Transport for London; the RMT says its refusal to equalise its staff’s pensions and travel pass rights is “inexcusable”. The Tube Lines workers’ strike committee has discussed plans for an ongoing programme of action, targeting key engineering projects over the coming months. Rail cleaners across multiple services and contracts will strike together on Friday 30 November and Saturday 1 December. This is the abridged text of a speech given by Workers’ Liberty supporter Edward Maltby to an AWL forum entitled “Our Remembrance: a working-class history of war” at the University of London Union on Thursday 15 November 2012. The meeting was attended by over 100 people, stirred up by a controversy around Workers’ Liberty member and ULU Vice President Daniel Cooper’s refusal to take part in an official University of London Remembrance ceremony. Kevin Paul was a member of the “strike maintenance and enlargement committee” of CLASSE, the radical Quebec student organisation that led this year’s struggle against tuition fee increases. He spoke to Solidarity during his recent speaker tour of the UK, organised by the National Campaign Against Fees and Cuts. Ahlem Belhadj, a doctor and a member of the UGTT trade union, is best known as the president of the Tunisian Association of Democratic Women. Ahlem has also been a Trotskyist for many years, and is currently a member of the Left Workers’ League (LGO). Against Ennhada [the Islamist party currently ruling Tunisia], what about those who propose a broad front ranging from the left to the supporters of the old regime? Several problems are posed by Ennahda. There are those concerning democracy and freedom, and also the social and economic problems, which are fundamental. On 24 November demonstrators against the cuts at Lewisham Hospital will assemble at 2pm at Loampit Vale roundabout, next to Lewisham DLR and rail station, and march to the hospital. Accident and Emergency, maternity, and complex and emergency surgery services at the hospital are set for closure under plans to break up the South London Healthcare Trust, which earlier this year went bust because of its spending on expensive PFI contracts.